Simonsig justified 8/15 favouritism to win the Racing Post Arkle Chase to give a first winner of the week to The Festival’s most successful trainer Nicky Henderson. Last year’s Neptune Investment Management Novices’ Hurdle winner was not always fluent at his fences and Henderson felt that further chasing experience would benefit the grey. “It was not quite the performance we expected but Simonsig was just too fresh and he has done very well to win. He was running with the choke out the whole way and even over the first three fences they were going quick, but he wanted to go even quicker. “He was just doing too much early on because we knew that Overturn was going to set a big gallop,” said Henderson, enjoying his 47th Festival success. “We have always said he is not short of pace but he needs to learn to drop the bridle a bit. He made one bad mistake and was going a bit too quick for his own good. He possibly needs to show a little more respect (to the fences) sometime. “There is another race in him this year – he could go to Aintree – as he has only had three starts and not been out since Christmas. “He looks a two-miler through and through and you can’t see him go two and a half with that style of racing, even though he won over that distance over hurdles. He will learn to drop the bridle but he has got to. He did well to get up the hill when pulling that hard. Reflecting on My Tent Or Yours, who finished second in the opening William Hill Supreme Novices’ Hurdle, Henderson added: “A P (McCoy) did everything right on My Tent Or Yours because he was tracking the right horse in the winner but just couldn’t get past him. He was not brilliant, but Simonsig was comfortably good enough to land the Racing Post Arkle Trophy for owner Ronnie Bartlett. 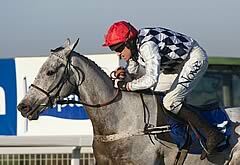 The grey seven-year-old completed a Festival double – he won last year’s Neptune Investment Management Novices’ Hurdle – but he was not fluent at every fence, and had to be ridden to the line by Barry Geraghty to hold runner-up Baily Green, a 33/1 shot. Simonsig won by two and a quarter lengths, and there was another 13 lengths back to third placed His Excellency. Geraghty said: “It was harder work than I expected – he missed the water jump down the back and one or two others after that, which is very unlike him, but he was brilliant at the second-last and tidy again at the last. “He really rallied on the run-in. He had to dig deep and battled well and we got the result, but I wouldn’t say it was a special performance. Bartlett, a potato merchant whose company sponsors the Albert Bartlett Novices’ Hurdle, which is held at The Festival on Friday, said: “He’s a dream come true. When you buy any young horse you don’t know whether they are going to deliver, but he’s just improved year on year. “All the hype in the last four weeks has been about two horses [Simonsig and Overturn, who finished fourth], but I’m a great believer in not staying away from good rivals, and today has proved that. He made a few mistakes, but he showed he can be workmanlike today. He dug deep and got the job done. Mouse Morris was delighted with the run of Baily Green who produced a fine round of jumping to bely his odds of 33/1 to run 8/15 favourite Simonsig close in the Racing Post Arkle Challenge Trophy. The seven-year-old had plenty of experience heading into this race but it looked like his limitations had been exposed when a fair third behind Arvika Ligeonnaire in the Racing Post Novice Chase at Leopardstown on Boxing Day. However, his jumping stood him in good stead this afternoon and mistakes from the rest of the field enabled him to get to within two-and-a-quarter lengths of the winner. “I’m delighted with that performance and my horses are in fine fettle,” said trainer Mouse Morris. David Pipe was equally as happy with 80/1 shot His Excellency, who finished 13 lengths behind Baily Green in third. “You’ve got to be happy with that effort,” said Pipe. Trainer Donald McCain was philosophical after Overturn’s fourth place in the Racing Post Arkle Trophy, for which he started 7/2 second favourite. “It was the ground, simple as that,” he said. 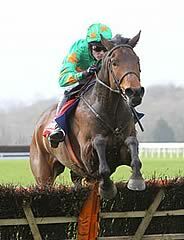 “Jason [Maguire, jockey] said he was never giving him the same feel as usual, never taking him forward as he can. The jockeys said after the first it was good to soft which, for a Flat-bred horse like him, is soft. And it was tacky and holding as well. “With a meeting like this you tend to get carried away and think maybe you’ll get away with it. There is, after all, only one Cheltenham. But in future we’ll follow the ground, and go where it is suitable. We’ll look hard at Aintree and Punchestown. The Racing Post Arkle Chase was inaugurated with its current title in 1969, after Arkle’s three wins in the Cheltenham Gold Cup (1964-66). In its first year, the race was worth £1,365 and was won by Chatham (10/1), trained by Fred Rimell and ridden by Terry Biddlecombe. The 2013 running has record prize money of £150,000. It was known as the Cotswold Chase before 1969. Since 1946, it has not been run twice, in 1946 because of snow and in 2001 because of the foot and mouth outbreak. The Racing Post, which backed the Arkle Chase for the first time in 2012, is only the race’s fourth sponsor. The Irish Independent’s support ran from from 2000 to 2011, Guinness sponsored from 1994 until 1999 and Waterford Cystal backed the race between 1991 and 1993. The lowest number of runners was six last year (2012) and the highest 19 (1987 & 2005) as the Arkle Chase - there were 25 runners in the Cotswold Chase in 1960. The current safety limit is 20. David Johnson with four winners - Or Royal (1997), Champleve (1998), Well Chief (2004) and Contraband (2005). Tom Dreaper is the most successful trainer of all time with five victories - Fortria (1958), Mountcashel King (1961), Ben Stack (1963), Flyingbolt (1965) and Alpheus (1971). Nicky Henderson leads the way among current handlers with four victories - Remittance Man (1991), Travado (1993), Tiutchev (2000) and Sprinter Sacre (2012). The most successful jockeys have been Glen Kelly, Pat Taaffe, Jamie Osborne, A P (Tony) McCoy and Barry Geraghty, with three wins each. The longest-priced winner was Gala’s Image, successful at 25/1 in 1987. The shortest-priced winner was Sprinter Sacre, returned at 8/11 in 2012. In the 65 runnings since 1946, a total of 15 favourites (23 per cent) have prevailed. The fastest time for the two miles of the Racing Post Arkle Chase was 3m 46.5s by Tiutchev in 2000, beating the previous best of 3m 52.5s set by Or Royal in 1997. IRELAND (16): Fortria (1958); Mountcashel King (1961); Ben Stack (1963), Flyingbolt (1965), Arctic Stream (1967), Alpheus (1971), Chinrullah (1979), Anaglogs Daughter (1980), The Brockshee (1982), Bobsline (1984), Boreen Prince (1985), Klairon Davis (1995), Ventana Canyon (1996), Moscow Flyer (2002), Forpadydeplasterer (2009) and Sizing Europe (2010). Until 1980, the Racing Post Arkle Chase was always run on the Wednesday of the The Festival. It now takes place on the opening day, Tuesday. 1978 Alverton (Cheltenham Gold Cup winner 1979). Alverton is the only horse to have won both the Racing Post Arkle Chase and Betfred Cheltenham Gold Cup.